Do you feel self-conscious about your smile? Do you often wish that you got your teeth straightened as a child, and worry that now it is too late? Then Invisalign could be for you! Invisalign allows you to straighten your teeth but without the wires and braces. 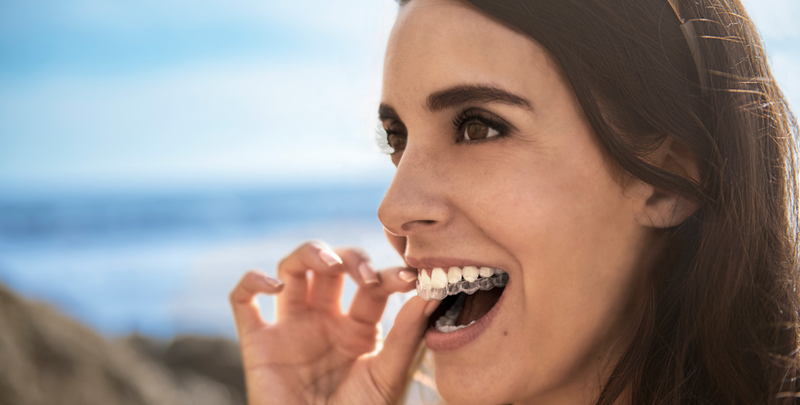 As the name suggests Invisalign is a nearly invisible brace allowing you to subtly create the smile you have always wanted. An Invisalign treatment is made up of a series of clear, removable aligners. These clear plastic aligners are custom made to your teeth and follow a plan specifically for you to shift to shift your teeth into place, over time. From the original consultation through to the end, our dentists will work closely with you and your teeth to ensure the most natural and easiest transition to a new smile. An initial treatment plan will be created with your smile goals in mind. Impressions will be taken of your teeth to be sent off to the Invisalign laboratories so they can process your specially made aligners. The impressions will then be used to create a 3D digital image of your teeth. This technology allows to predict every step of your journey and show how your new smile will look. This technique uses computer technology to create clear almost invisible aligners used to straighten crooked teeth. Each aligner is work for two weeks and then changed until the treatment is complete. This can take between 9 and 18 months depending on the severity of treatment needed. If you want to smile with confidence, Invisalign is your answer! For a consultation, or to discuss any queries you may have, feel free to contacts us here.